This is one of my favorite drinks in Dubai! It is like a welcome drinks for them. Sorry, I don't really remember the name but try show this photo to them and ask for it! hahaha. Don't forget to try their Beryani Rice, that's my favorite! Dining at Al Fanar is an atmospheric experience. 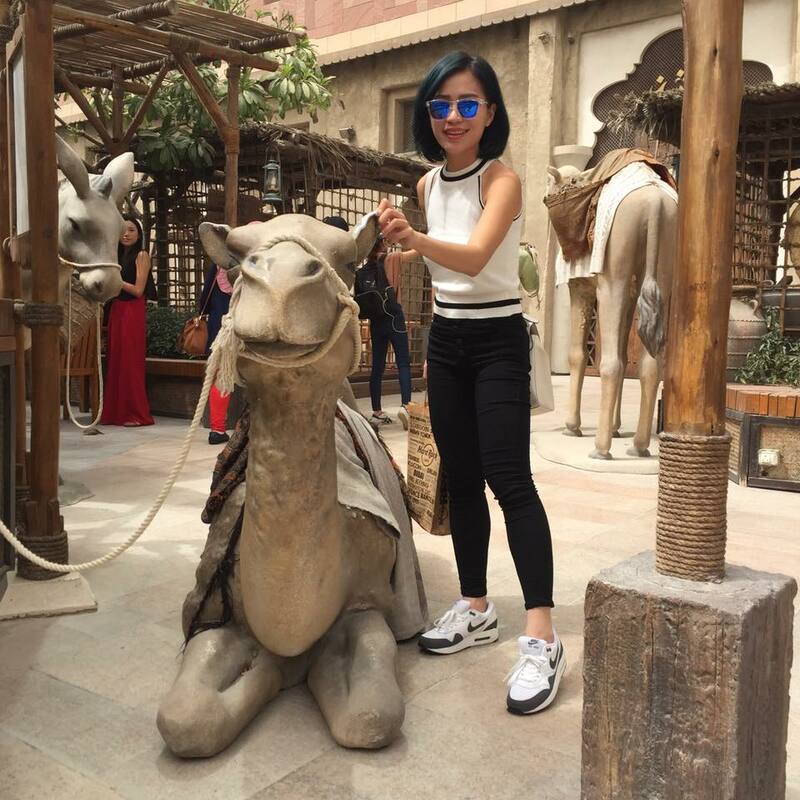 It is decorated with all sorts of cultural theme ,wall hangings and even imitation camels at the entrance of the restaurant! They having indoor and outdoor seating. Indoor seating also excellent with old architecture and arts. Surprisingly, the place appeared to be populated entirely by locals too. Oh well, When you see the local people in a restaurant you know that it must be good. Overall, it was a great place to enjoy all the local Arabian food. If you come to Dubai and want to enjoy truly local cuisine, the Al fanar is the place to start. 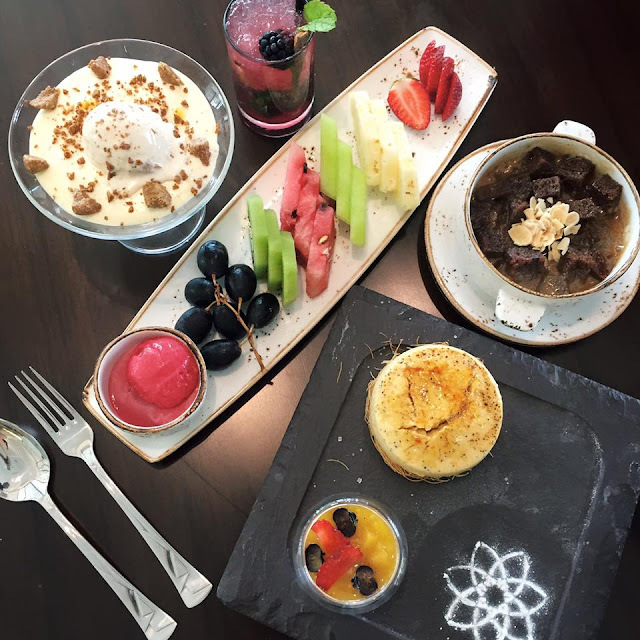 Looking for Emirati Cuisine with modern twist in Dubai? Try Seven Sands out! It is a blend of traditional and modern food. It is located at Jumeirah Beach Residence ( JBR ). Basically it is an all-day dining Emirati cuisine restaurant with a terrace featuring views of the sea, quite chilling. The menu includes breakfast, lunch and dinner, and doubles as a café, and a shish lounge. kibbeh filled with minced lamb meat, pine seeds and almonds, infused with bezar spice, served with rocca salad and tahini sauce. This is my favorite dishes! Remember to order this when you're there! Arabian desserts! The seven sands warm dates pudding with toffee sauce is the bombbb! Address : The Beach, Dubai Marina, Makani No. 1145374508. I'm the happiest kid when they decided to had chinese cuisine as dinner. We had our dinner at KUAI, which is located at the newly open Box Park. Box Park is a new district that launched along Dubai’s Al Wasl Road earlier this year. Crave for chinese food when you are in Dubai? check this out! They serve Chinese food in a casual setting free from any MSG additives so you can rest assured that all the delicious flavors of Kuai’s dishes come from nothing but the best ingredients, including gluten free options. The interior, inspired by street art, is a living testimony to the graffiti artists walking the streets of Dubai. I love Afternoon Tea, after all what’s not to love about spending a few hours in a beautiful restaurant, indulging in cake and scones, drinking fine tea from fancy crockery? Ultra luxury resort hotel Madinat Jumeirah is offering an afternoon tea experience like no other. The quintessentially British tradition deserves to be celebrated. Afternoon tea might be a quintessentially British pastime, but Dubai has a whole host of options rivalling anything the UK has to offer. So, if you’re a tea-lover, do some smart attire and head to one of these spots for your high tea fix. The assortment of sandwiches was delightful – there was everything from chicken to ham to cucumbers and cheese to keep anyone’s taste buds satisfied. Every dishes is so lovely, so Instagrammable. Overall, it was a great experience. Afternoon tea with a view of Burj Al Arab. Lobby Lounge, Al Qasr Hotel, Madinat Jumeirah.